According to a new study by Panopto, inefficient knowledge sharing cost the average large US business $47 million per year. The study also found that 60 percent of respondents found it difficult or nearly impossible to obtain vital information to their job from colleagues. Ecommerce relies on institutional knowledge sharing to ensure product information is accurate, up to date and can drive sales across sales channels. The inability to work efficiently and collaboratively cross-departmental impacts businesses of all sizes. Most brands have disparate processes and systems that inhibit optimal efficiency for their ecommerce channels. What can companies do to drive efficiency? I sat down and asked our Senior Customer Champion, Jim Lesko, about efficiency and what makes product experience management teams successful. 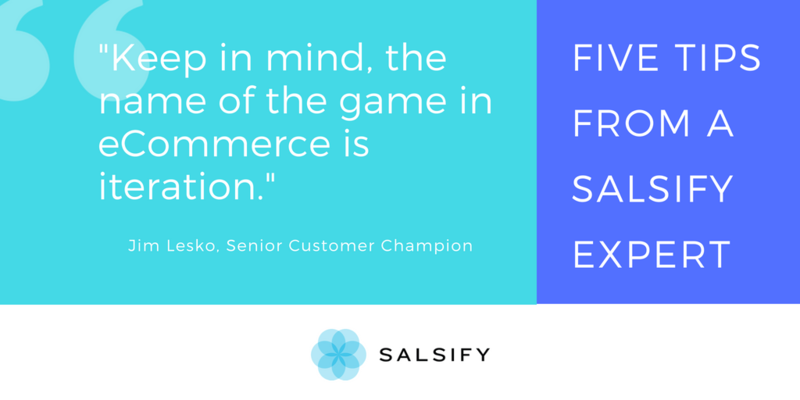 As a Customer Champion Jim is responsible for ensuring customers realize the value of the Salsify platform. Jim has worked with over 50 customers spanning several industries during his time at Salsify. Check out his top 5 must-haves to how to drive efficiency across your team. A supported strike team is one of the most important drivers of efficiency. Without a team that has support from management or executives, it is difficult to achieve success and have your organization work cross functionally. The most successful brands identify their key influencers leading the catalyst, who knows the products, where to find information, and who can make the most impact. For some brands it’s the Data Team who can set up product content with ease and then administer tasks out to other teams, at other organizations you have product managers and the ecommerce team working in unison. The biggest downfall I’ve seen is when ecommerce teams set themselves up for failure by trying to accomplish too much in a short period of time. I tell customers to channel their inner product manager: understand your organization’s priorities, and always have a deliverable in mind that is three months out. Focus on your most important channels and products first -- brands can set themselves up for success by focusing on the top 20% of their product catalog first (which likely drive 80% of total sales) and give themselves the best chance of driving the most sales dollars and ROI. Having a multi-phase adoption and roll out plan will help your organization hit goals. Defining what success is in third month, sixth month and a year will help your organization be more efficient. When teams don’t have measurable, defined key performance indicators to guide their efforts they often go in a tailspin. Examples of multi-phase roll out plan with defined success can be simple: Amazon content for our top 50 products needs to 100% ready for syndication and at least 10 products publishes by month 3 of implementation; by month 6 we’ll expand to Wayfair and Walmart in addition to Amazon. For example, Workflows enable teams to engage with right people at the right time -- think about how a Brand Manager can easily assign copy writing tasks to a Copywriter within the platform for a particular product. More employees can be exposed to product information and don’t need to be Salsify experts--a small team can be the experts who educate the rest of the organization on how their responsibilities fit. Based on your organization, Salsify will highlight gaps in content and process. That is a good thing. It means you can improve upon your product content and processes constantly. It’s important to be working within the product to determine how it can streamline processes -- can a workflow task be assigned to the legal team to ensure compliance rather than sending a series of emails? Yes? Great. You just made your legal compliance easier. Having a well-defined objectives by your end point and product subset is going to be the best thing. Efficiency is not possible without internal transparency. The most successful brands I’ve worked with value internal transparency and collaboration. They’ve used Salsify as an opportunity to engage other teams; the strike team has laid out a framework and a process describing who needs to be involved and from where to source information. A Salsify implementation presents an opportunity for a brand to redefine their process internally and allow for improved communication. Keep in mind, that the name of the game in ecommerce is iteration. Your merchandising is flexible on the digital shelf-you can make changes easily if you have the right processes and technology. You should be releasing products as you can. There’s no point in sitting on a product that is ready to go out for a prolonged amount of time.